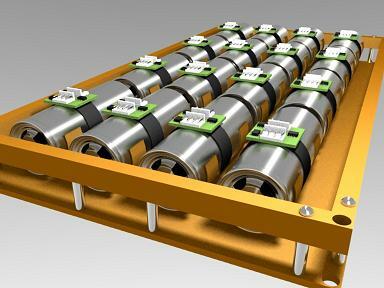 I first became interested in lithium ion battery systems when I completed a number of projects for Advanced Lithium Power (www.advancedlithium.com) in Vancouver, B.C. Although I have not yet documented any of those projects here, I did complete a number of experimental devices on my own, one of which is outline here. BMS - In an effort to find a better way to monitor the cell voltage, temperature as well as to handle cell balancing, I designed what I believe to be a unique method of optically isolating the Dallas family of one wire (1-wire) battery fuel gauge devices. Although the paper presented below has to do with battery monitoring, the same technique could be applied to any of the 1-wire devices where optical isolation is required and a small amount of battery power is available on the isolation side. Where other designs require the use of a costly DC/DC converter to transfer power across the isolation, this circuit does not. Note the use of the power opto-coupler for data coming back across the isolation. This is due to the fact that the timing of the 1-wire devices are critical and using un-powered couplers resulted in excessive delays. The un-powered isolator in the data in direction is tolerated in terms of timing and is used to limit the current requirements on the battery side. Also note the use of the opto-coupler in the circuit for cell balancing. This should be replaced with a suitable FET for increased current handling but I just have not had a chance to go back and edit the schematic. Since the writing of this paper I have had a chance to experiment with a number of other battery monitoring devices that can handle multiple cells at once and include optical isolation for multicell packs. These devices include the maxim max11068 and the Linear Technologies LTC6802. Please contact me if you are interested in discussing these further.